Konan’s Fuller Defense Training Dojo Excels at the 46th Annual Wisconsin AAU Championships. 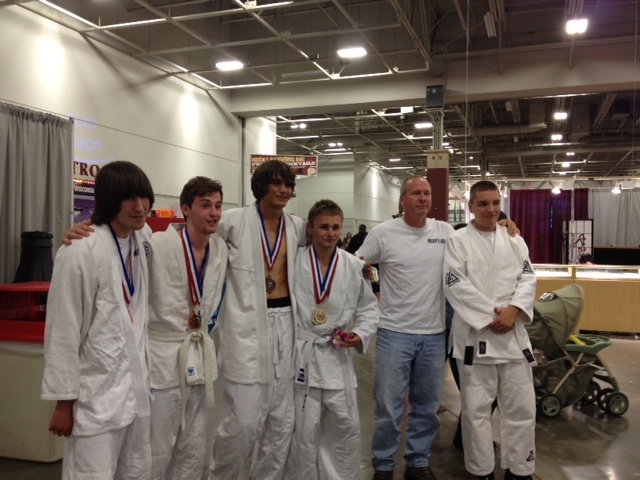 Left to right: Jaymeson Tarbey 4th youth, Dalton Rogers 3rd mens, 4th youth, Adrian Peters 3rd youth, Thomas Hunt 1st mens, 2nd youth, Me coach, and Corey Tibbs who did not place but only in judo for 3 months and wanted to compete!! This entry was posted on August 14, 2012 at 8:05 am and is filed under Dojo News. You can follow any responses to this entry through the RSS 2.0 feed. You can leave a response, or trackback from your own site.